LOCAL ANGLERS ARE SOMETIMES favored to win fishing contests on their home waters, but the outcome of these events often surprises everyone. Their intimate knowledge of every piece of structure and cover, and reconceived expectations of where bass should be, tend to get in the way of making decisions on the fly. Out-of-towners, on the other hand, can benefit from their unfamiliarity by "fishing the fish ." Bass are creatures of habit strongly influenced by the conditions around them - the anglers that figure out what these fish are doing, and more importantly why, usually do best. There was definitely a shortlist of pre-tournament favorites going into the final CITGO Bassmaster Western Open on Lake Shasta, with guys like Greg Gutierrez, Russ Meyer, Jim Riley and Bill Townsend showing up at the top of most lists. But it was a lesser-known local, without a major win, who made the decisions that took top honors. "This time of year the bass should be in the creek channels and chasing shad up points," admits Redding, Calif., pro Howard Hughes, "and although they should be eating spoons and Spooks, I thought it would be more of a spoon bite. One day I threw swimbaits for quite a few hours in the morning, but it just wasn't working for me." Although many of the anglers fishing Shasta stuck with typical autumn patterns hoping they would eventually produce better than average bass, Hughes decided that it would be in his best interests to try another approach. "All I had to do was turn my trolling motor on and run the first big creek channell found," explains Hughes, "and when the fish weren't in the middle, moving around, I knew I had a problem. If there are fish in 35 feet of water and they aren't actively feeding, you aren't going to catch anything on spoons. "The Spook bite is obvious because it's calm, and the bass start busting the surface on a regular basis," observes Hughes. "When you hear a couple of splashes, or see trout coming out of the water running for their lives, you're pretty sure a Spook may be the ticket. But after a couple of days not seeing those conditions, you just have to abandon it." Hughes considers himself a good riverbed fisherman and says that his knowledge of fish behavior and Shasta's tributaries were key to his win - especially during this mid-November tournament, when bass would be running upstream as water temperatures began to drop. Hughes has known about the area he targeted in Shasta's Pit arm for a long time and that bass stack up in specific spots every fall. By concentrating his efforts on these fish-holding locations, he was able to catch plenty of bass, continuously culling-up until securing the victory. 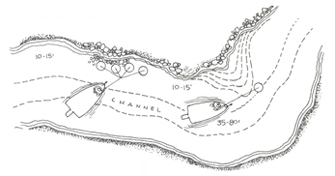 "The channel is long and straight as you move in," describes Hughes, "but all of a sudden there's two quick bends with 80 feet of water around them. That's the last deep water and the bends in the channel break the current. The shad hang out on those quick bends and that's where the bass are, too." In addition to targeting bends where shallow areas dropped into deeper waters, Hughes looked for bass along transitions where banks changed from dirt to rock or vice versa. Although he would fish an entire bank as he followed a creek channel, he would stop and methodically cover the transition areas. Hughes attempted to catch larger bass on the mornings of Days 1 and 2 of the tournament, but it was his afternoon Pit arm bite that allowed him to make the cut and fish the final round. On the third day of the contest, he spent all of his time in the Pit. "The bass were there feeding on very small shad," says Hughes, "so I began throwing a 6-inch shad pattern worm and a 5-inch green/pumpkin with black flake Senko rigged wacky style. To catch these bass, I had to fish real slow so slowly, in fact, that it usually took me about 30 minutes to cover 100 yards." 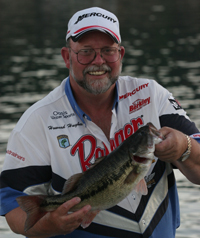 Even with an ample supply of bass stacked-up in the upper portion of the Pit that Hughes was targeting, it took a unique presentation to entice bites. "I was very much finessing," claims Hughes, "but triggering a reaction from the bass that were chasing shad meant that I had to shake it (the worm or Senko) violently using only light weight - it wasn't just a little doodle-doodle-doodle, but a real pop." Hughes' excitement almost cost him the tournament, which he won by just under a pound, when he lost a quality fish at the boat. "On the first day, I hooked a fish that would have probably gone 2 1/2 pounds," chuckles Hughes, "but I was in a hurry and missed lipping it - when I went to lift the fish by its belly, it shook free. I became too conscious of my nonboater, who was doing well, and started fishing too fast. Once I slowed down, I was fine." flake Senko and a 6-inch shad pattern worm. agressively shaking it for bites. from one structure to another.